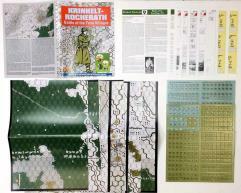 BATTLE OF THE TWIN VILLAGES: KRINKELT-ROCHERRATH is a natural follow-on to the successful Hurtgen Forest monster. The Battle of Elsenborn Ridge was the only sector of the American front lines during the Battle of the Bulge where the Germans failed to advance. The battle centered on the Elsenborn Ridge east of Elsenborn, Belgium in the Ardennes forest. West of Elsenborn Ridge, near the cities of Liège and Spa, Belgium, was a vast array of Allied supplies and the well-developed road network leading to the Meuse River and Antwerp. The Germans planned on using two key rollbahns or routes through the area to seize Antwerp and force a separate peace with the United States and Britain. Capturing Monschau and the nearby village of Höfen, and the twin villages of Rocherath-Krinkelt just east of Elsenborn Ridge, were key to the success of the German plans, and Hitler committed his best armored units and infantry troops to the area, including the 12th SS Panzer Division Hitlerjugend. The green, untested troops of the 99th Infantry Division had been placed in the sector during mid-November because the Allies thought it was an area unlikely to see battle. Their soldiers were stretched thin over a 22-mile front, and all three regiments were on line, with no reserve. In early December, the 2nd Infantry Division was assigned to capture a vital crossroads marked by a customs house and a forester’s lodge named Wahlerscheid, at the southern tip of the Battle of Hürtgen Forest. They transitioned through the 99th division's lines and after a deadly, costly battle, capturing the crossroads. But the Germans counterattacked in what the Americans initially thought was a localized spoiling action, but was actually a leading element of the Battle of the Bulge. The 2nd ID consolidated their lines, pulling back into Hünningen, and then to the twin villages of Rocherath-Krinkelt, and finally at the dug-in positions held by the 99th ID at Elsenborn Ridge.